Compatible with the Internal YS Converter. 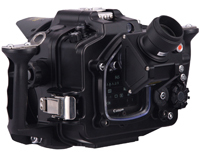 U/W Housing for the full-frame Canon EOS 6D. Set Items [Accessories] Housing body cap, camera quick shoe, two hex wrenches. Contact an official SEA&SEA service centre near you to install the internal YS Converter/C. ● Accessory connector (supplied with the converter) is fixed in the accessory port. 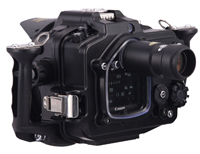 ● LED showing battery charge remaining is situated above the viewfinder on the rear of the housing. ● 3 mode strobe selection switches (for Left and Right) are located inside the housing. ● Battery box (for CR2 lithium battery) is situated inside the housing. * When using external strobe(s) either the 5-pin Sync Cord/N or the 5-pin Dual Sync Cord/N is required. YS Converter/C can now be built into the MDX-6D housing. With the (optional) internal YS Converter/C, the ergonomics of the housing system will be greatly enhanced. 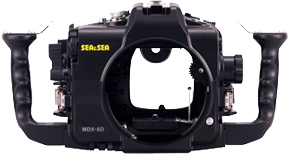 TTL exposure-compensation and switching between TTL and Manual modes are controlled from the housing. Remaining battery power can also be checked from the housing. * The internal YS Converter can be installed by your nearest official SEA&SEA service centre. By attaching the VF180 (#46112) or the VF45 prism viewfinders (#46111) (magnification ratio of 1.2x) to the housing, the magnification increases by 1.2x and entire field of view can be seen at the same time. Recommended for users committed to strict composition and focusing. * You may encounter some difficulties to access the info button function if VF45 1.2x is installed on the housing. To avoid this problem, manufacturer suggests using VF180 1.2x instead. The housing comes with N type connector (2-pin wired). Every detail of the housing is precision-machined from a solid aluminum-alloy block to achieve a high-quality texture and design, The black-colored anodization strengthens and protects the housing. 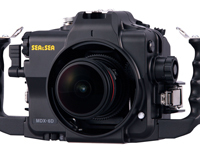 Controls: Almost all the Canon EOS 6D essential underwater functions (except Depth-of-Field Preview button) can be used. Equipped with Accessory Port which can be used for HDMI output. * When optional internal YS converter/C is installed, the accessory port is used for this purpose only. 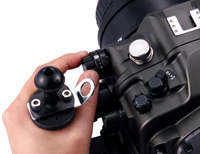 Shutter lever tension can be adjusted with a spring. The grip design has been significantly improved with the travelling diver in mind. The grips are mounted with threadless fixings to facilitate easy transportation, mounting and removal of the grips. The new design also alleviates corrosion build up around the fittings. All fixings are available as spare parts. Fitted with a tripod socket on the centre underside of the housing.